Another post from Weigy Widyanputra who's kind enough to share his culinary experience during his stay in Jakarta, Indonesia. Thanks, Weigy! 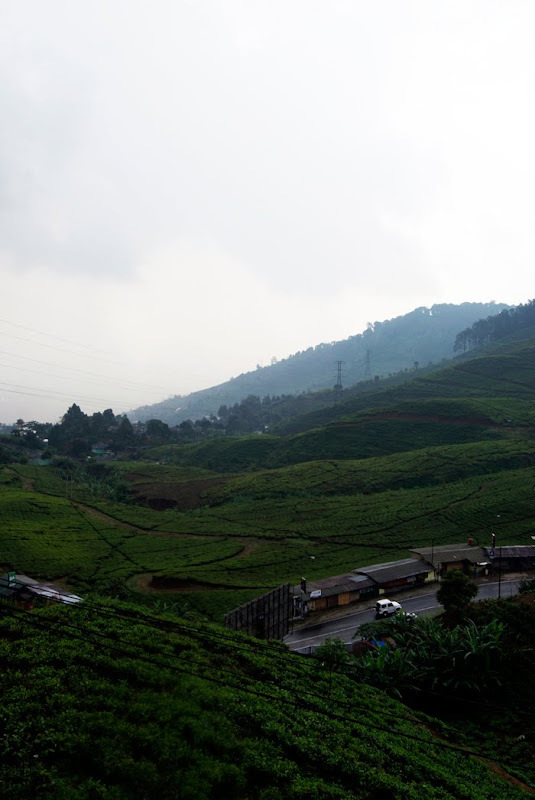 Hop in a car, drive away from the urban jungle that is Jakarta and in 2 hours, you will find yourself in Puncak, Bogor. Skyscrapers get replaced with hills, rice paddies and clouds. Shopping complexes get replaced with store-houses selling local food, crafts and daily necessities. The only constant seem to be the traffic; seasoned drivers in both Jakarta and Bogor navigate like lions after gazelles. The first hour of the drive you will still experience similarity but keep driving. Soon enough there will be only tiny shacks by the side of winding roads, with undulating greens, gently nudged by a cloudy sky. If there is a consolation to the way we Indonesians drive, Bogor's traffic is sparse on the weekdays. This being the month of fasting also meant a lot of the places were closed in the day. Still, a family run satay shop waved us down, to signal that they are open. We took a step in and was amazed by the view. This was a concrete-based, wooden-floored shack hanging off the side of a hill. 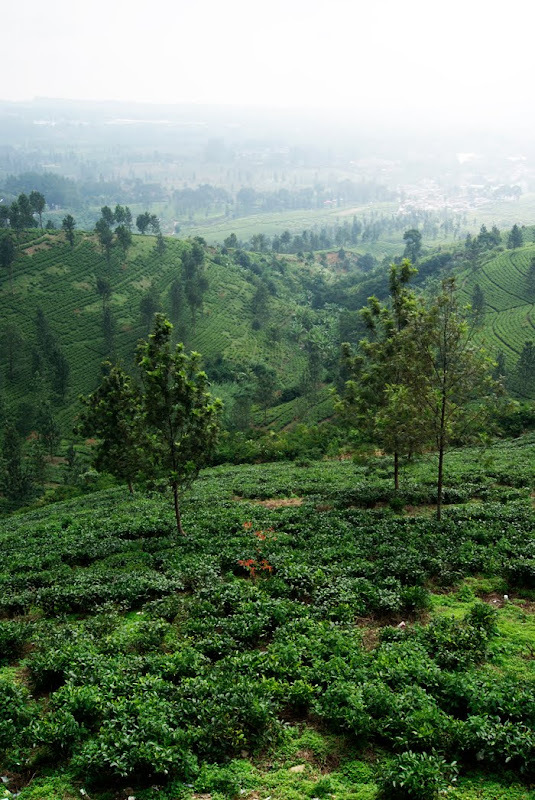 Before us was an unobstructed view of the hills, a calming breeze and a blanket of fog. 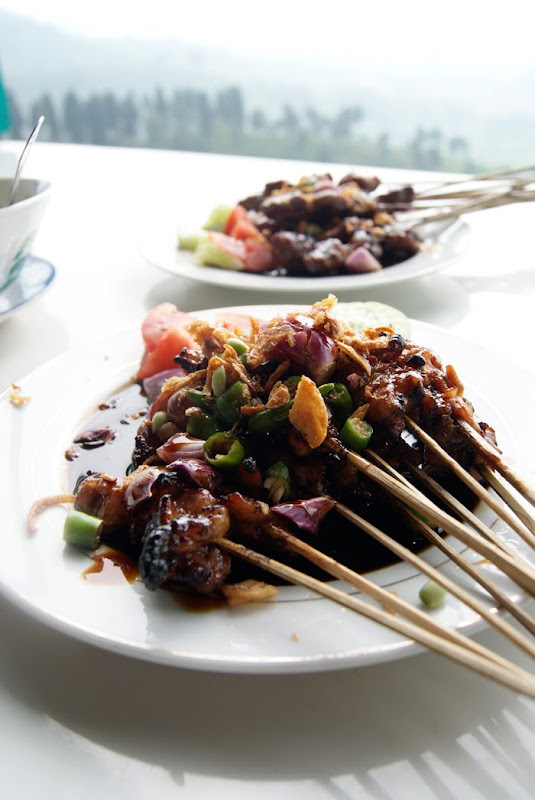 Their specialty is "Sate Kelinci", that means "Rabbit Satay / Skewers" and "Sate Kambing", which means "Mutton Satay / Skewers". We ordered both, sat down and took in the view. In my head, I honestly couldn't stop thinking that if we were in any other place, this location would have been capitalized on, made into a fancy restaurant, charging exorbitant prices for a view coupled with okay food. In reality, satay is already served as overpriced, bland, appetizers at misguided fusion restaurants. The skewers come topped off with fried shallots, bits of red onion, chopped fresh tomatoes and assorted chillies. Basking in both the light and sauce it's resting on, the view got even better. The rabbit was cooked perfectly, the rabbit was springy but not chewy. The judgement to serve this not drenched by the sauce was also a great move. The consistency was top-notch, the presentation was appetizing and again, it tastes great. The way the meat has been treated matches and in some ways, exceeds some fine French chophouses I've been to. If you are looking for ways to try rabbit as a delicacy, this would be a great way to start. Simple, tasty and unobstructed. The mutton received the same respect and care, at a glance it is impossible to tell the difference. The aroma sets them apart. The mutton had a more prominent aroma, strong but not overpowering. The fact that the garnish was identical reminded me that the strength in these dishes is in how they've showcased the flavors of each meat. The usual gamey aftertaste of mutton was noticeably smoother and not obtrusive at all. The slight tinge of blackened tips, coupled with a tender core, this is great mutton. I asked the store-owner / chef if his is the best around here, he humbly replied in Indonesian, "Ah, all are the same, we've all been at this for years and years". It reminds me of a fact: simple eateries in Asia that specializes in one dish excels at it simply because they've been improving on a family recipe for decades. Simple eateries in Asia usually starts as sources of food for the locals who aren't of high or middle-level income brackets. 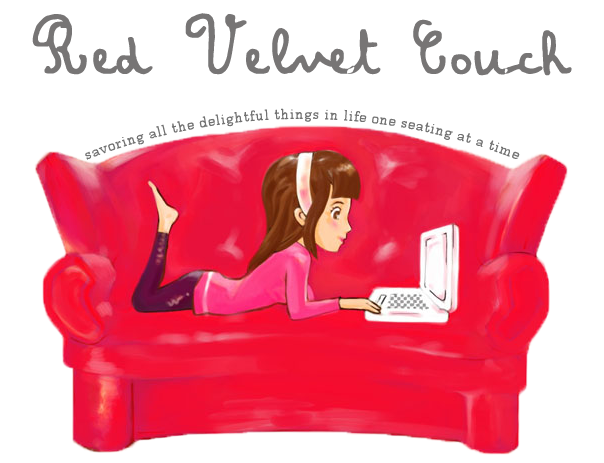 Every ingredient is used to the most, in consideration of nutrition, taste and conservation. There is a delicate balance in the way the food is treated that you won't find in Outback or such. All this cost me a meager $ 5.00 US. 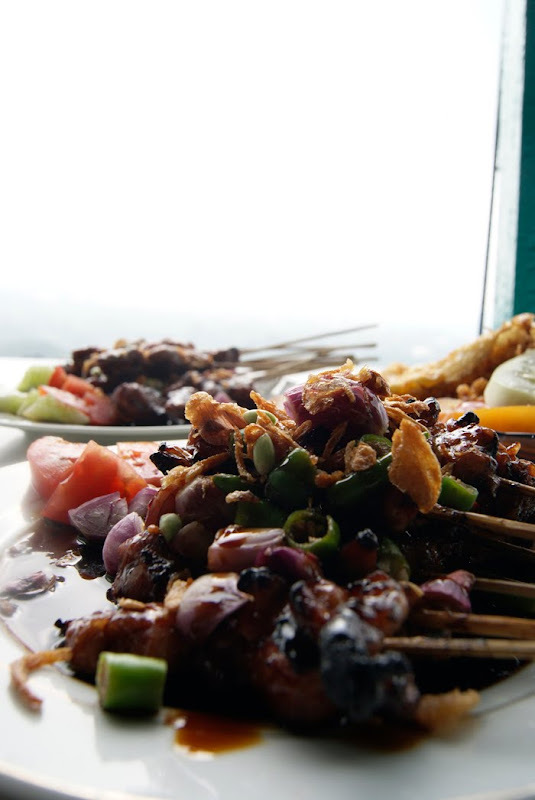 There is no name to this place, you simply have to look for a small turquoise barbecue shack with a great view when you are on your way to the peaks of Puncak (which means peak, by the way). "No Shirt- No Shoes- No Problem"